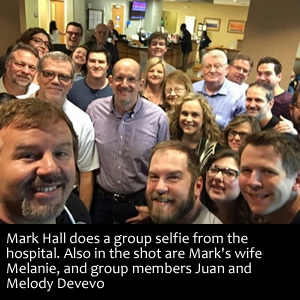 Casting Crowns lead singer Mark Hall is now recovering following surgery to remove one of his kidneys, after doctors detected a mass in that kidney. The directive from doctors was to remove the kidney then take readings on Mark’s overall health; that would determine if further treatment like chemotherapy would be necessary. The group kept fans up to date via social media; saying that everything could not have gone better. “The day started off with the band and close family and friends praying with us at the hospital. There was a feeling of Christian fellowship and a peace. Laughs and hugs. Mark is out of surgery. Everything went really well. Dr says textbook operation. Just like we prayed for. I told the doctor that he might possibly be the most prayed for Dr. on the planet today. He will be in recovery for a while. Thank you so much for your prayers. Continue to pray not only for a full recovery, but for complete healing.